Coupon websites are rapidly becoming a popular way to make money online. With some of the new premium WordPress coupon themes out there, your coupon site can almost run itself. A powerful website with customer portals and PayPal integration is within your reach with most of the themes in our list. We’ve done the research for you and constructed a list of the most useful features. 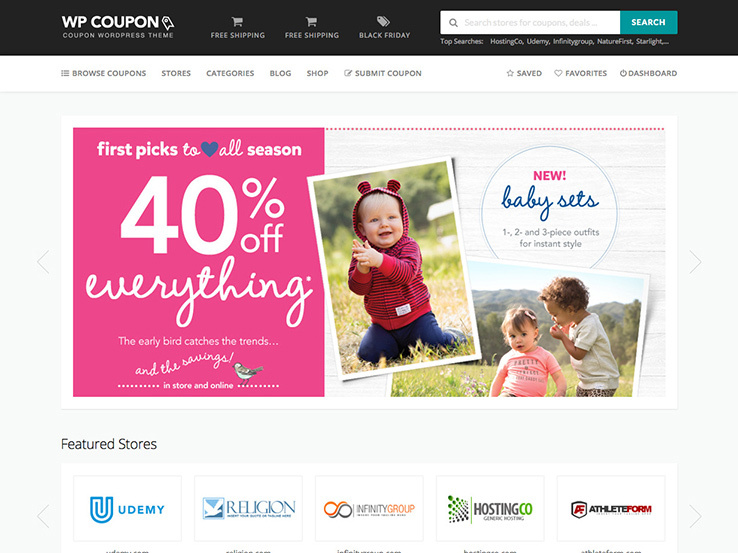 What Are the Must-Have Features of a Coupon Theme? A quality coupon theme will incorporate all the latest design trends and best practices to make your site visually appealing and easy to use. Most themes on this list offer your users front end submission of coupons as well as a ratings system for your coupons. Search and filter functions will make your website user-friendly. Additional features include membership portals, advanced reporting and tracking systems, and monetization options which allow you to include affiliate links and sell ad space. Also important are options for easy customization responsive design so your site is friendly to mobile users and still completely functional on desktops. All of the themes in our list have many, if not all, of these key features, as outlined below. Without further ado, here is our list of some of the best-of-the-best WordPress Coupon Themes! WP Coupon is a very powerful theme that allows you to offer three types of coupons: Promo Codes, Deals or Offers, and Printable Coupons. Fully responsive for shoppers on the go, this theme has a clean and uncluttered layout with plenty of white space. Using the jQuery image slider and the jQuery carousel you can feature your best performing coupons or particular stores. 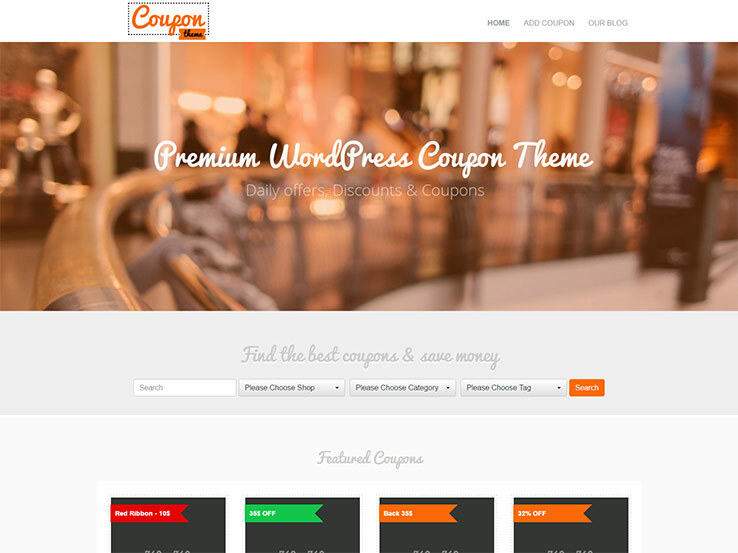 WP Coupon also includes dedicated templates so you can create automatically updated Categories and Stores pages. For a great user experience, coupons open in a modal window, the Ajax-powered Search feature is intuitive, and the Ajax-powered Login/Registration is simple and straightforward and also opens in a modal window. When your members sign in, they have access to a dashboard for saving their favorite coupons and keeping a list of their favorite stores. Monitor how your individual coupons are doing with coupon tracking and a coupon success meter. Take advantage of several powerful coupon controls including affiliate link cloaking, automatic redirect to the affiliated store, and coupon expiry options. WP Coupon has many easy-to-use features for customizing and modifying the appearance and behavior of your site. Also, you can keep your visitors up to date with a MailChimp newsletter and keep your site active and interesting with an integrated WordPress blog. If you try this powerful theme, please let us know what features you liked the best. ClassifiedEngine is one of the easiest ways to set up a business marketplace where sellers can post products or services and buyers can find them. 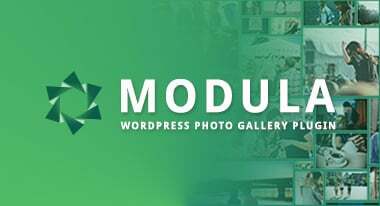 The layout is unique and modern with a full-width premium photo slider. You can do a lot of your customization from the front end (home page), including optimizing for mobile, and the back end includes features such as translation, customizable sidebar widgets, and setting currency formats. For your sellers, you can set up a variety of payment plans including a free plan and premium plans which give them the added bonus of featuring their ads. For each plan, you can set an automatic expiry date for ads. ClassifiedEngine’s payment gateway allows you to offer any of these payment methods: PayPal, 2CheckOut, Stripe, PaypalExpress, Paymill, or manual bank transfer. This theme makes it easy for sellers to post their ads and photos and choose a payment plan. You can tailor your “post ad” form by adding custom fields. The seller dashboard allows your users to monitor and manage their ads. You can provide buyers with powerful search, filter, and sort functions, grid or list views, and email notifications of new ads. They can click on an ad to get details about that item, post ad reviews, and see ads for comparable items. Seller profiles allow buyers to look at all the ads from a particular seller, and contact sellers directly through private messaging. If you want to take it further you can sell ad space on your sidebars to businesses in the same niche as your site. Or you can join affiliate programs that are a match for items that people are searching for on your site. Don’t forget to extend your network by using Yoast to optimize SEO, activating the social media functions, and maintaining a useful and entertaining blog. If you have discovered more ways to boost your marketplace sales by using ClassicEngine, please let us know! Coupon Theme gives you the power to create a flexible affiliate marketing coupon site in minutes. There are a large number of child themes to choose from to get the look you want, and you can change the look when you want to refresh your site. You can take your customization even further through open source code. And don’t forget to check out the responsive design options so mobile users can really benefit from what you have to offer. With a single license you can set up as many coupon sites as your imagination can dream up if you own your website. Coupon Theme’s administration panel will help you manage those sites and keep track of all your users. It also enables you to tailor your registration and listing form fields to your various markets. You have a lot of control over how your coupons behave. Options include click to copy, click to reveal the code, click to open the coupon in a new window, and printable coupons. Grouping by Store or by Category will help you optimize your SEO and help your visitors hone in on what they are looking for. You can use sidebar widgets to feature specific coupons or codes and you can also sell advertising space on your websites (don’t forget, you can have more than one). And this theme has features to help you decide what advertisers to reach out to. Users have a lot of control through their personal member account area to manage and monitor their listings, photos, order history, invoices, account details. As administrator, you can monitor activity and send automatic payment or renewal reminders to your clients. Plus you can use it to send out your own bulk emails about your own offers. If you have found other ways to make this very flexible theme work for you, please fill the rest of us in on your discoveries! 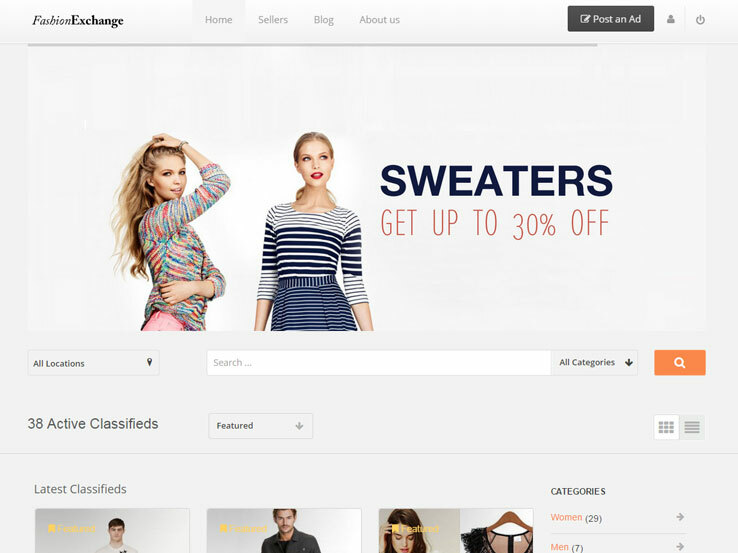 Couponer is a beautiful responsive theme that is also retina ready. Retina ready means there are more pixels per square inch, making photos look even better on the web than they ever have before. 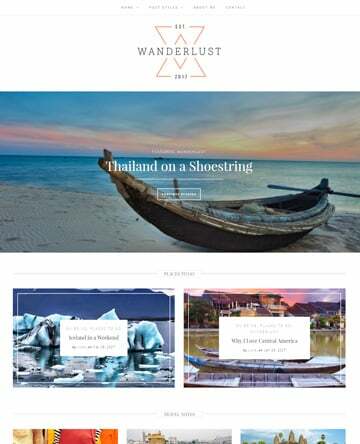 This theme offers more than a dozen page templates and custom post types as well as custom widgets for additional content on your sidebars. 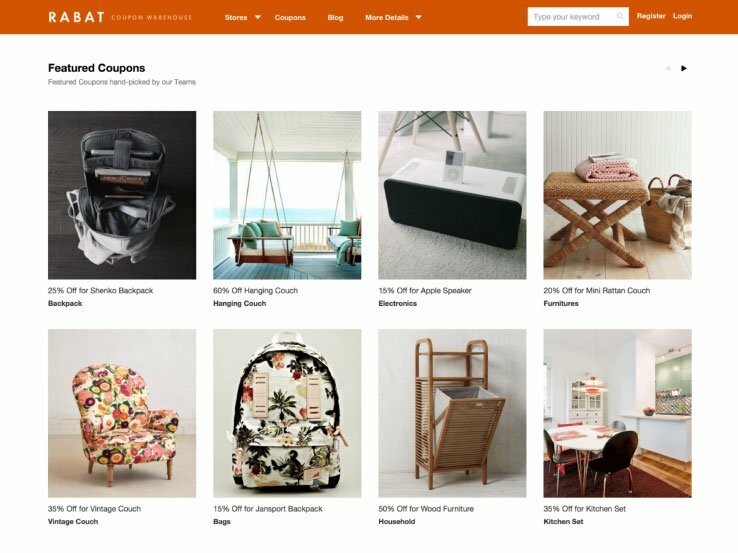 All the features you need to build a successful coupon or discount website are here: an AJAX-powered search function, categories, sorting, featured deals, daily offers, a great customer portal, MailChimp, and more. Through the membership system your visitors can submit and access their coupons and discounts easily, and you can offer Members Only features. And with Couponer you get SEO optimization so the search engines can find you. The Couponize WordPress theme is a fully responsive theme built on the Foundation Framework. It has a clean, modern interface which is easy for beginners to work with. But more advanced developers will appreciate the option to use their own custom CSS. This theme is cross-browser compatible and integrates well with a number of popular plugins such as the GD Star Rating plugin which allows your visitors to rate your coupons. Another powerful integration is the Wysija newsletters plugin to help you grow your email list. You have many options for customizing your coupons including colors, sizes, buttons, and text. The theme comes with a gorgeous photo slider at the top which you can use to showcase featured deals. The search feature allows users to filter their search by published date, expiry date, or user rating. Don’t forget to enhance your search engine ranking and engage your network by using the blog feature. The blog area gives you a place to display the most recent coupons in a mini-slider. This theme’s sidebar widgets allow you to feature popular coupons, popular companies, and even embed videos. 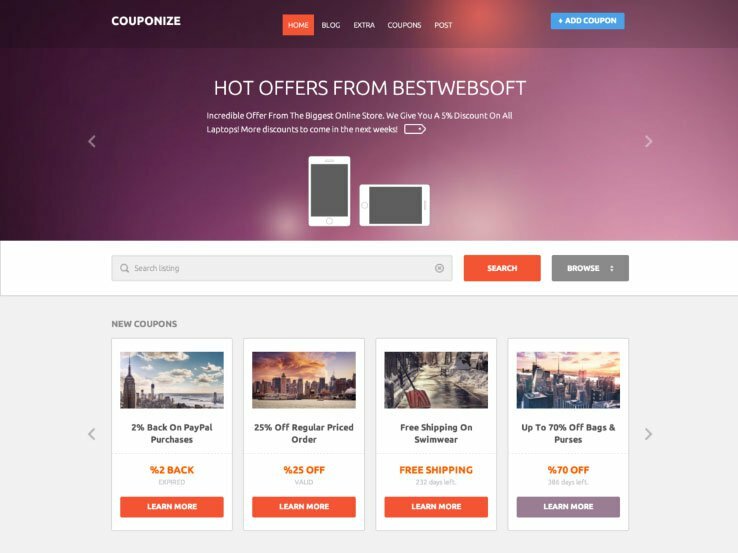 Couponize makes it easy for users to submit coupons from the front end including all the details such as descriptions, images, code, and how much people can save by using a particular coupon. 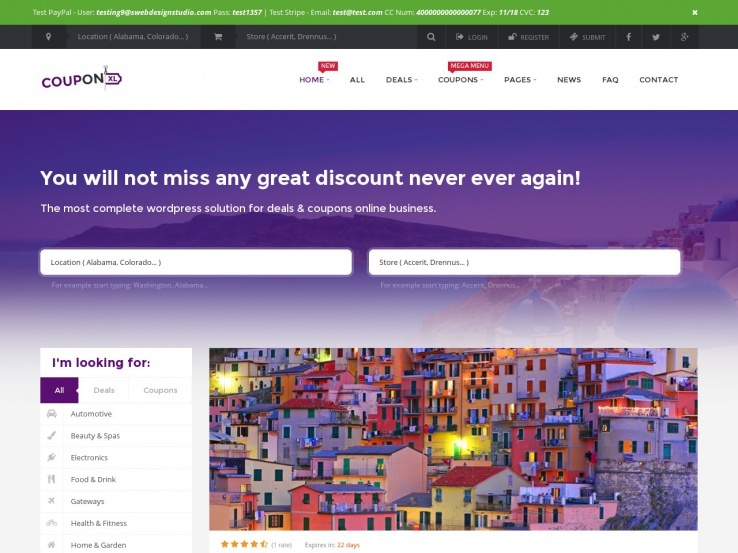 The CouponXL WordPress theme is tailored for selling deals, discounts and coupons online. It’s fully integrated PayPal, Skrill, Stripe, and. PayU. MailChimp is on board to help you grow your email list. The full membership system brings in a loyal following and has the potential to bring you a passive income stream. The random code generator makes it easy to come up with unique codes, and the custom profile dashboard allows users to build their own accounts and track their deals and coupons. With features for different types of coupons, social registration, front-end coupon submission, and more, you can’t go wrong with this coupon theme. The DailyDeal theme, a Templatic creation, is the quintessential daily deals theme for sharing niche or local products and services at low prices. This theme is easy to use and allows you to publish new ads with ease. Coupons can also be submitted from the front end of your website. Every aspect of your website can be customized to your liking for a truly unique website. 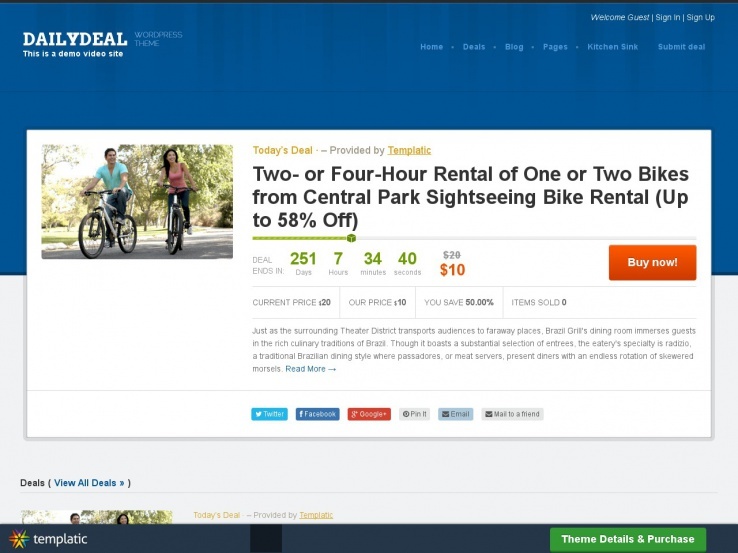 Powerful search and filter functions allow your visitors to easily search through your featured offers and daily deals. The DailyDeal theme integrates with various payment gateways such as PayPal, Authorize.net and Google Checkout. A standout feature is the affiliate program module so visitors can sign up and promote your products on their own sites. You can also send out automated notification emails and maintain a blog to keep your users engaged. The REHub WordPress theme is a modern and powerful coupon and deals theme that allows you to turn your website into a money-making machine. The default layout looks a lot like any standard online magazine, consolidating all of your coupons and showing plenty of content on the homepage. The theme also includes a mega menu which is a great option if you have a lot of pages on your website. The enhanced user reviews system is ideal for building credibility and letting customers have their say. Use the WooCommerce plugin to start bringing in money, and create your own little affiliate program where bloggers can talk about your products and send more sales your way. REhub integrates with several popular WordPress plugins like Easy Digital Downloads, ECWID and bbPress. The layout builder makes designing easier for beginners and and had options that advanced users will appreciate. The top section offers a dedicated place to showcase the hottest products in each category. 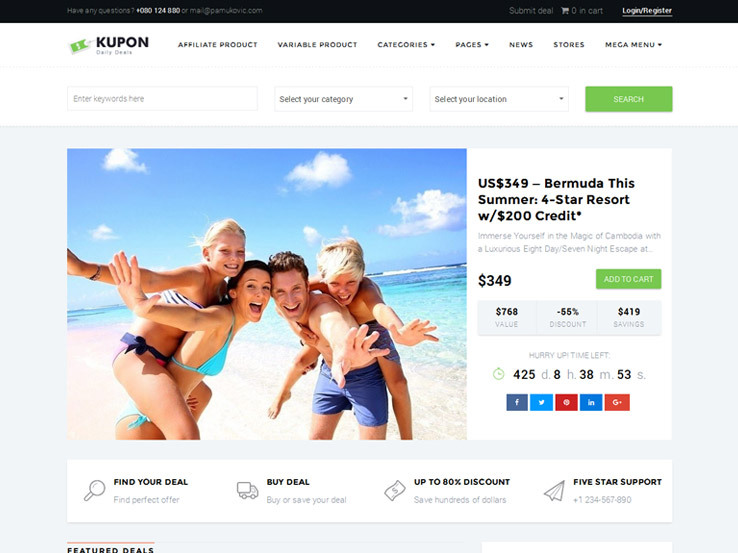 Kupon theme is best suited for a daily deals website although it can be adapted to create an online store featuring affiliate products, digital products, physical goods, and more. 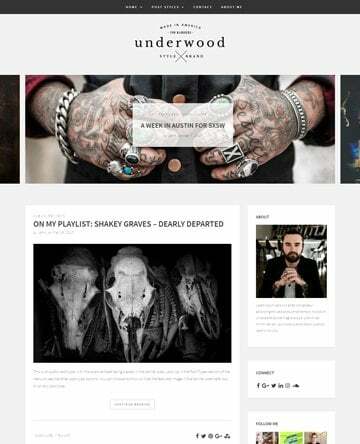 The theme offers two different layouts, each of which has a clean and minimal design. This allows you to avoid unnecessary clutter and put your content into the main focus. The theme has powerful search and filtering options so your visitors can easily search for the coupons they are most interested in. The header area can be used to feature a hot deal or an offer that’s about to expire. The rest of the page allows you to display various categories of coupons in a grid-based layout. The back end of the theme is tightly integrated with WooCommerce, allowing you to easily collect payments. Your visitors can easily submit coupons and deals from the front end. Kupon includes the Visual Composer plugin which allows you to tweak the layout of your website without touching a single line of code. It supports the WPML plugin which makes it easy to make your website available in a number of different languages. On top of that, the theme is fully responsive and has all the features you need to create an elegant coupon website. 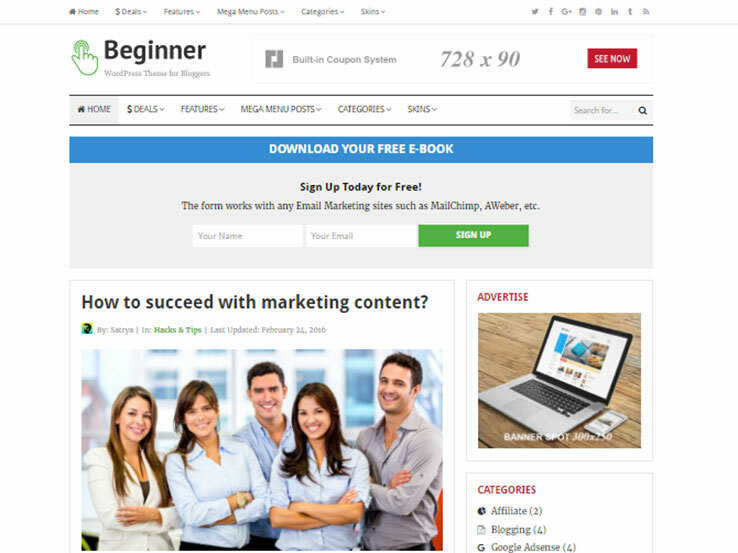 Beginner is a clean and responsive WordPress theme for professional bloggers and serious online marketers. With built-in coupon functionality, you can easily run your own coupon sites. The theme features a prominent Call To Action area at the top, which is perfect if you want to feature a particular deal or grow your email list. Beginner includes several post and page layouts which allow you to add variety to your website’s look. A notable feature is a separate page dedicated to featuring deals and coupons so you can easily monetize your website. Another section for deals is included at the bottom of the home page. You can also sell ad space on your sidebar. The theme has different skins available and you can easily customize any of them through the theme customizer. On top of that, this theme also includes 12 custom widgets so you can easily add your latest posts, social media profiles, and more on any page of your website. Coupon theme is an impressive theme featuring a responsive and clean design with a gorgeous header image which is a great place to include a short blurb about your website or a Call To Action. Your visitors can easily search for coupons bystore, category, or tag. Featured coupons are organized in a grid-based layout. Your users can easily submit their own coupons on the front end and coupons can be set to never expire, expire in the future, or to go into effect in the future. All coupon links are cloaked with nice permalinks. The theme includes plenty of shortcodes, which allow you to add various design elements such as buttons without touching a single line of code. The theme options panel allows you to customize every aspect of your website and the SEO optimized code will ensure your website gets a boost in the search engine rankings. 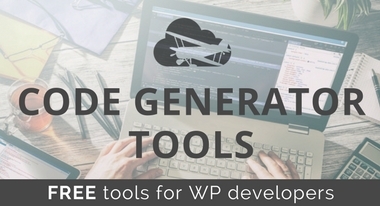 Finally, the theme also supports the WPML plugin which allows you to translate your entire website and offer your coupons to a global audience. 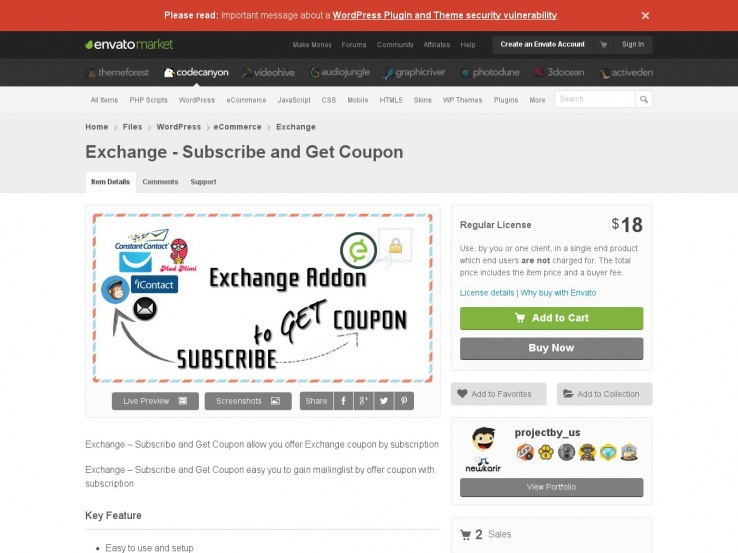 The Exchange – Subscribe and Get Coupon plugin works with any coupon or deal theme you are currently using for your website. The idea is to exchange a coupon for something in return. For example, you might be giving away a coupon for Best Buy, but users can only download the coupon once they sign up for your email list. This way, you build your email address list and have the opportunity to sell to those people in the future. The plugin works well with just about every mass emailing system, such as MailChimp, iContact, ConstantContact, MadMimi, and more. There are only a few steps involved in activating this plugin, and it runs flawlessly with the iThemes Exchange system. The plugin comes with a social media sharing component to make it easy for your readers to spread the word about amazing deals on your website. Keep in mind that this is a plugin, not a theme, but it works wonders for selling coupons, vouchers, and licenses from your website. We recommend using an additional theme since this doesn’t have all the styling elements that you might expect from a full theme. 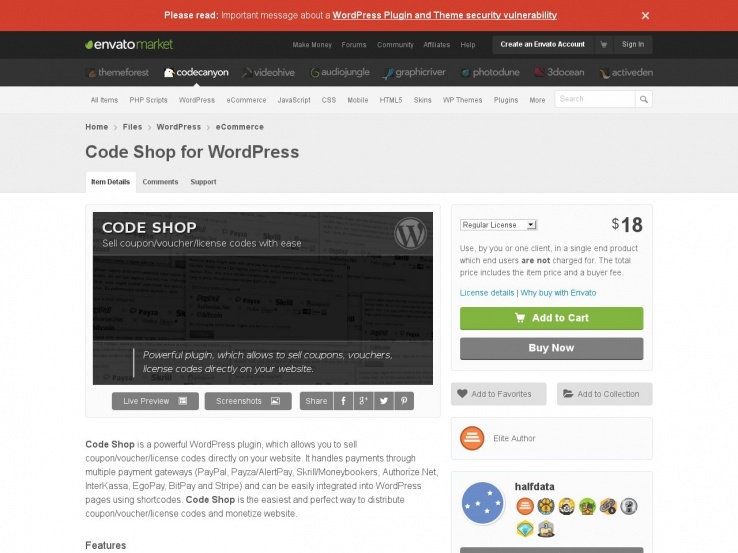 Use this plugin in conjunction with any theme to create a stunning coupon website. In addition, you can create an unlimited number of campaigns, and you can work with multiple payments gateways including PayPal and Authorize.net. Free coupons are supported, and you can accept a variety of currencies. All of the coupons and vouchers are sent through email, and the translation-ready nature of the plugin assists you in reaching out to a global audience. 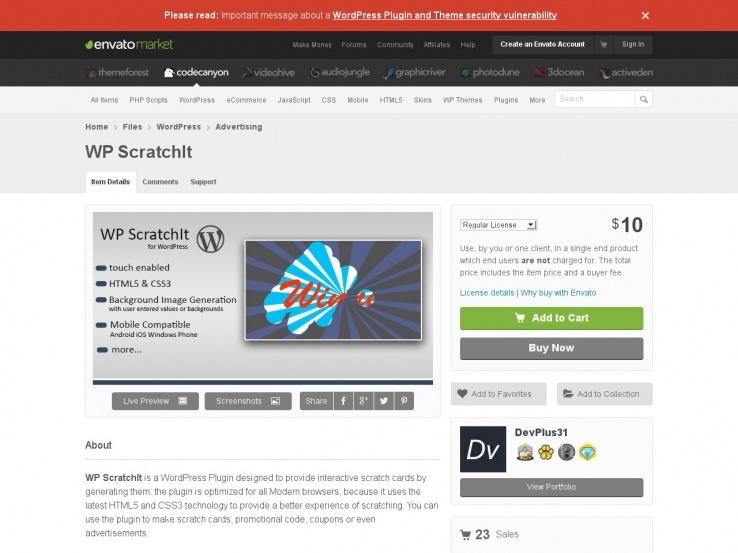 WP ScratchIt is the plugin to use if you need a way to give away scratch cards on your site. Although you’ll need to pair this with another theme, it’s a pretty cool plugin, since it has a touch-enabled feature so your users can scratch off their tickets on mobile devices. You can use HTML5 or CSS with this plugin, and use the background image generation tool to add a little touch of branding that users will see when they scratch off their tickets. The WP ScratchIt plugin is completely compatible with mobile devices – people on the go will be able to scratch tickets on your website while they sit in traffic jams. Manage several scratch cards from the same dashboard, and generate different backgrounds for the values that will appear when a user finishes scratching off their card. You can even customize further by auto-drawing the behind scratch image. Although using this plugin may require more development experience than some, it is fun, and can help you can generate stronger interest for your coupons. Coupon Creator is a plugin that turns your current theme into a true coupon powerhouse. You have to upload this plugin to your WordPress back end. After that, a simple shortcode is all that’s needed to display the coupons. Coupon Creator offers you a few options to choose from when uploading your coupons. You can upload an image of the coupon which can be downloaded and printed, or you can generate a digital coupon to be used online. The shortcode feature is one of the best reasons to consider using this plugin, since you don’t have to know anything about code to get things rolling. In fact, you simply create your coupon and put the shortcode wherever you want to on your site. After that, it can be seen on the front end. Tons of coupon customization settings come along with the plugin. For example, experiment with the border themes. You are not just stuck with the basic dotted lines. You can insert columns and rows, and you have a lot of choices available for managing expiration dates. Overall, it’s a solid choice if you don’t want to completely change your WordPress theme. JC Coupon is another WordPress plugin that can transform your website into one that offers coupons. Two of the plugins that we have discussed here are free, which is a great thing when your budget is tight. But JC Coupon offers a paid version if you’d like to upgrade to get even more features. This theme has all the tools necessary to include coupons in posts, pages, and sidebars and you can set expiration dates and custom text. Use the coupon management module to manage your coupons and monitor their performance. When coupons expire they disappear from your site. This cuts down maintenance time for you and ensures that customers aren’t seeing expired offers. You can place all coupons on your sites by using shortcodes. This ensures that you can get a coupon up quickly without messing around with the source code. Another great feature of this plugin is the built-in affiliate link cloaker, which keeps all those URLs from cluttering up your website. The Rabat theme is fully responsive, so it looks great on any kind of device. Infinite scrolling on the home page allows you to display a lot of content without overwhelming your users. 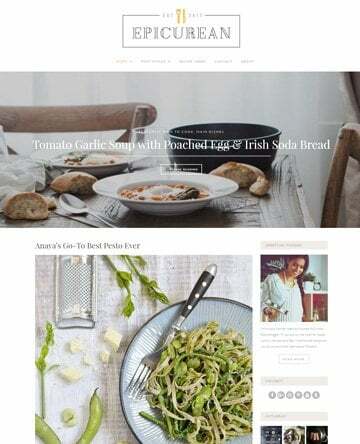 The layout is a clean, modern-looking grid style. 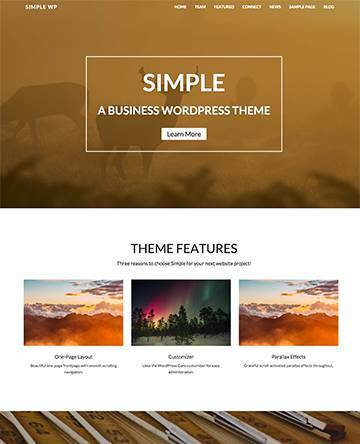 This theme includes several custom page templates and an options panel that makes it easy for you to tweak it even more. Your users can control and monitor their accounts through their own dashboards and you can offer them a variety of payment methods including Bank Transfer, PayPal, and Authorize.net. Rabat supports three types of coupons: Promotion, Coupon Code, and Printable Coupon. There is also a ratings system which allows you to monitor the success of individual coupons. What about: http://themeforest.net/item/couponxl-coupons-deals-discounts-wp-theme/10721950 in my modest opinion this one is crazy good. Hi Max, Thanks for the note. I’ve added the Couponxl theme. Let me know if you feel like we’ve missed any other great WordPress coupon themes that should be on the list. LOL did you ever tried CouponXL or any other copupon/deal wp theme? CouponXL is the best of the best honestly. I tried almost all for my small startup company (will not provide url because I do not wanna advertise for free) and CouponXL WP Theme is ‘cream de la cream ‘from all those believe me. Show me one coupon/deal website where is possible and in same time affiliate import on and no problem. But simple changeable meta fields which are required for import affiliates doesn’t allow strings to be translated etc. For all, COuponXL WP is the best of on the market, Stripe, Skrill, Paypal, Mailchimp, Import affiliates, works perfect in combination with WP All Import and Yoast etc. The Rabat theme is great if you just want a simple coupon site and nothing more. If you want a cross between coupons and a bit of advertising go for CouponXL as its much more comprehensive. Hi, all of them are looking very nice. But which one I choose? which one is best in your opinion? I want SEO friendly theme. Anyway, thanks for sharing nice list. Hi Manohar, We’ve seen a lot of folks working with clipper and have heard pretty good feedback but the design is a bit dated. If you’re comfortable with some basic html and css you could give it a little face-lift and have a really nice platform to build on. A massive list of wordpress coupon themes & plugins. This is the age of coupons & deals websites. Coupon site is one of the most profitable way to make money online. 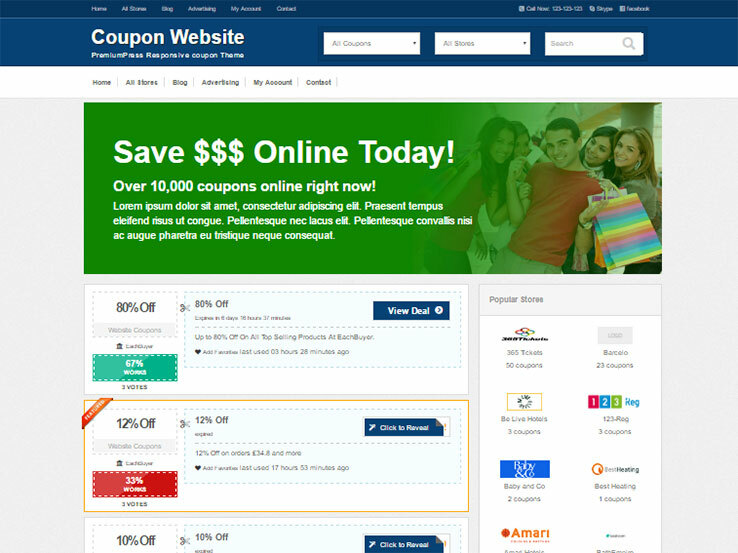 So there is a huge demand for coupon themes with useful features. I love CouponXL theme. I think it is one the best and most complete coupon as well as deal theme. You get tons of features including an integrated membership system. Thanks for sharing, CouponXL does have a strong reputation for being one of the best themes out there. Out of all these wonderful WordPress coupon themes, which ones allows affiliates to cloak their affiliate RSS datafeed and update their WP coupon blog automatically with fresh content? Thanks for sharing good list of coupon themes. I found Rehub best suitable. Would be great if you could include our coupon plugin as well. https://www.coupondaddy.in/coupon-maker-plugin/ it’s absolutely free and easy to use. Can we add the related deals option on CouponXL View offer Detail Page via any mean? actually m a noob & willing to make a deals+Coupons Site via wordpress. I found this site great, but 1 thing is missing, i am unable to find the “related Deals” option on view offer detail page. Of the all, I believe Clipper is easy to use theme, with lot of market place addons I would suggest people to use it. I am using Clipper with flatter and it works perfect. is COUPON THEME BY PREMIUM PRESS easy to use I mean admin panel is user friendly or its complicated. I mean its easy as clipper theme ? Thanks for the feedback! 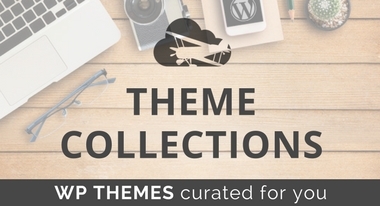 What is your favorite feature of these themes? Would love to hear more about your experience. From the above list I worked on Couponpress theme from Premiumpress and Clipper from Appthemes. As frequently say I like both of them. Premiumpress have additional features that I can’t find in other themes. For example – users can submit their own coupons in the store. AppThemes consistently produces quality themes, and these two are great examples of their work. well I am trying premium press. just not easy as clipper. What did you find difficult about Premium Press? Couponer and PremiumPress look very official. These types of themes will work best with high traffic coupon blogs that output lots of blogs hourly and daily about niche related coupon content. 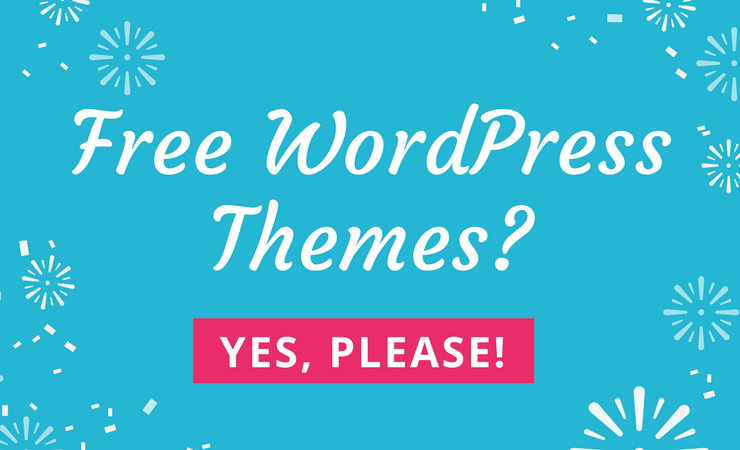 Are you willing to offer a one time download of these WordPress themes in exchange for rave reviews posted on the website about them and a link recommending people to come to your site to purchase them if interested? Thanks for reaching out to us, but at this time we will have to pass on this opportunity. wow! thats amazing from all these themes i chose couponXL, wonderful theme but if you’re beginner you have to work hard to understand and know how it work, very confusing and so much to handle. I suggest veryone to do it with wp developer as its not easy task to edit theme. i did and crashed my theme twice. Daily deals, coupons and offers are my main area. I am trying my hands on this theme. We really appreciate the heads-up with working with this theme. Thanks for sharing your experience with us. How did it turn out? Thanks for the feedback! We are glad you found our content relevant. Very nice collection and I will definitely buy the rehub theme because it is one of the most popular theme. Hi Bikash,\n ReHub is a very a nice theme, and I especially like the mega menu it offers. Please share you site with our readers once you are finished. We would love to see this theme in action. CouponPress is better in my view and I have used it. Supports advanced features and allows fair deal of customization. Thanks for sharing your feedback with us. We are consistently hearing great things about CouponPress. 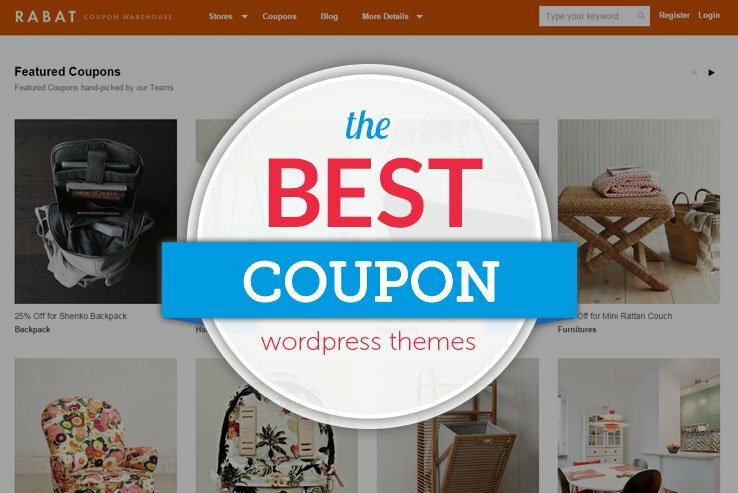 Thank you for creating a nice collection of best wordpress coupon theme. I liked Rehub most.It’s support is great. HI Rehana,\n I am so happy you found the collection useful. Support is one of the most important features of buying a theme, and it is good to hear Sizam, the authors of Rehub, offers premium service. Thanks for sharing your experience with us. ReHub is a great theme; I can see why you are attracted to it. What type of site are you creating? Sarah… I have a blog name Birthday Greetings . I want to use ReHub theme in this website. Is it possible to use. ReHub could work, but you might want to take a look at some Pinterest Style Themes. They might offer you a better way of categorizing your greetings and allow other to submit more. Let me know your thoughts. 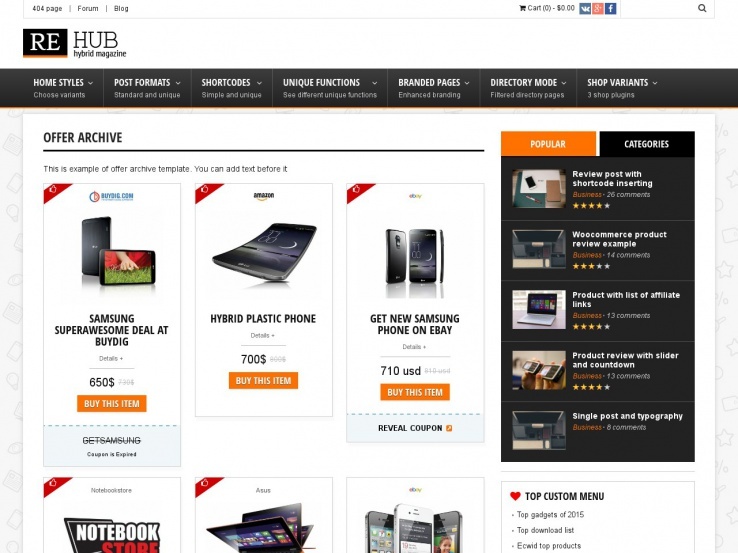 You might want to add few more great coupon wordpress theme like CouponXL and Comre. Great minds think alike, CouponXL is a part of this roundup 🙂 We will, however, check out Comre and add it to our list for a future update. Just wondering out of curiosity if this there will work well with the WP Clipper theme. Do you know if the WordPress Clipper theme is required to make this child template work? Hi, which theme are you referencing? stopping by your blog again to inquire about best WordPress coupon themes. Which theme would you recommend for sending out mass e-mails to opted in permission-based e-mail subscribers? There are Too many Scripts and As I seen every Person Has Different Views of Different Theme I am Going to start Coupon Website and Can you Please Suggest which one is Best and Easy to work with for beginners? But as I observed there are many positives for clipper and premium press..
Hi, What type of Coupon Website are you looking to create? Are there any specific features that are important to you? Glad we can help! What features are you looking for in a theme?